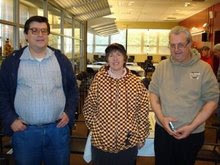 Frank Brady, Bruce Pandolfini, and Asa Hoffmann discuss the Marshall Chess Club in this short video on YouTube. Tonight, at the Marshall Chess Club, two international masters will give a lecture at 7:30 on their highlights from the Foxwoods 2008 tournament. The IM's are Jay Bonin and Robert Hess. In a follow-up to his previous video on the Philidor Counter Gambit, ChessTheBlitzer states his opinion that White gets no advantage after 1.e4 e5 2.Nf3 d6 3.d4 f5 4.Nc3 fxe4 5.Nxe4 Nf6. Besides asking for feedback from viewers on how White could proceed advantageously after 5...Nf6, the narrator requests specifically that I explain my position on the 4.Nc3 variation. I have played the line after 4.Nc3 fxe4 5.Nxe4 on many occasions and have always responded with 5...d5 instead of 5...Nf6. In my opinion, White maintains an opening plus after 5...Nf6, which is not the best move. Only by playing 5...d5 does Black strive for advantage. After 5...Nf6, the pawn on d6 blocks Black's king bishop from developing to b4 or c5 or d6. But 5...d5, pushing the d-pawn forward with tempo, unleashes the power of the black KB. To critics who say that 5...d5 is an example of too many pawn moves for Black in the PCG, I pose this question: what did you expect from an opening named after Philidor, the champion of the pawn? With the world's attention focused on the upcoming 2008 Olympic Games in China, Garry Kasparov editorializes on the 2014 Winter Olympics scheduled to take place in the Russian town of Sochi. These are my two best games from today's Viking quads in Somerset NJ. 51.Rg5 Kb6 52.Rg6+ Kc5 53.Rg5+ Kb6 54.Kc3 Kc6 55.Kd4 Rd1+ 56.Kc3 Ra1 57.Rh5 Rc1+ 58.Kb3 Ra1 59.Rh4 Kc5 60.Rh5+ Kc6 61.Kb2 Ra4 62.Kb3 Ra1, draw. 32.h5 g5 33.Bf5 Rb8 34.b4 Nd7 35.Bxd7 Qxd7 36.Re4 b5 37.g4 Bd8 38.Qe2 a5 39.Rxe5 dxe5 40.Qxe5+ Bf6 41.Qxb8 Qxg4 42.Kc1 Qc4 43.Qg3 Bxc3 44.Qd3 Qxb4 45.Qc2 Qa3+ 46.Kb1 Qb4+, draw. A couple of days ago, the chess diagrams on my blog vanished mysteriously. They were generated at http://chessup.net/, but the ChessUp website no longer allows me to create diagrams. Where is Trent Lucier when we need him? At Jim West Talks Chess, I have posted my drawn game in the Fajarowicz variation against Boris Privman, from last Saturday's quad in Hamilton. In my review of Bobby Fischer Goes to War, I made reference to a book review in The New York Times called "In Chess as in Life, Nasty Guys Really Can Finish First." Here is the Times review. I have been playing the Fajarowicz variation in the Budapest defense for one year. To me, the Fajarowicz is to 1.d4 what the Philidor Counter Gambit is to 1.e4, a risky but playable attempt at winning for Black. Lev Gutman, who has written a book Budapest Fajarowicz, drew this game in 2001 against Felix Levin. Speaking of the Philidor Counter Gambit, Frederic Fournier analyzes the game Kojovic-Jovanovic, Belgrade 2008 in which Black essayed the PCG but lost because he played the inferior 9...Be7?! instead of 9...Kf7. Even 8...hxg6 is playable. Recently ChessTheBlitzer posted a 8:41 minute video on YouTube in which the narrator recommends either 4.dxe5 or 4.exf5, after the opening moves 1.e4 e5 2.Nf3 d6 3.d4 f5. Without any supporting analysis being given, the narrator states that White gets no advantage after 4.Nc3. These are my best games from today's quad in Hamilton, where I had a final score of 1-1-1. 32.Qe3+ Kf7 33.Qe7+ Kg6 34.Kh2 Qc4 35.Qe3 Kf7 36.Qe7+ Kg6 37.Qe8+ Kh6 38.Qe3+ Kg6 39.d7 Qd5 40.Qe8+, Black resigns. 30.Qc8+ Kg7 31.Qxf5 Qxg1+ 32.Kxg1 gxf5 33.c5 Ra1 34.c6 Rc1 35.Kf2 Rxc6 36.Bc4 Kf6 37.Ke3 Ke5 38.f4+ Kd6 39.Kd4 Rc7 40.a4 Ra7 41.Bd3 Rb7 42.Bb5 Re7 43.Bd3 Rb7 44.Bb5, draw. Was Leonardo Da Vinci a chess player? 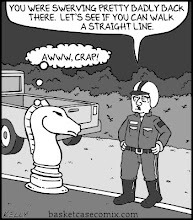 Did he draw chess illustrations? The Gamesters of Thompson St.
Class C player Sal Geraci told me recently that his brother lives on the block in Greenwich Village where there are two chess shops. Sal was referring to Thompson Street, which I visited briefly last December. 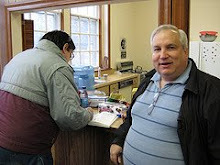 A participant in a quad at the Polgar Chess Center needed to have his digital clock repaired. 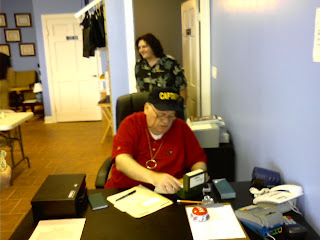 So I wound up driving him and a couple of other players to one of those two shops, where the proprietor Dave fixed the clock for a small fee. 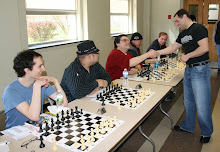 Breaking through with his queenside pawns, international master Dean Ippolito won a king-and-pawn endgame against me on Sunday at the Spring Viking Deluxe grand prix event in Branchburg NJ. I resigned because of 43.f4 Kc6 when White is in zugzwang. 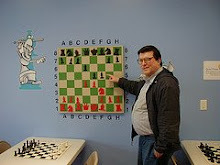 The playing site was the Dean of Chess Academy. I enjoyed reading this opinion piece by Jon Swift, whose satiric style reminds me of his namesake Jonathan Swift, regarding Bobby Fischer's role in winning the Cold War versus the Soviet Union. 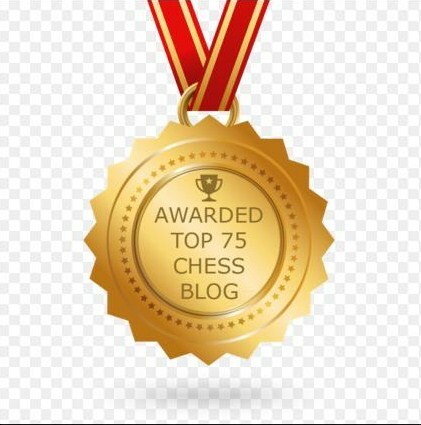 At chessgames.com, there is a heartfelt remembrance of Bobby Fischer by an Italian woman named Elisa Sarto. Jan-22-08 Liz: PART 1: DEAR FRIENDS, I WANT TO SHARE WITH YOU A SPECIAL MEMORY OF BOBBY FISCHER. I had the privilege of corresponding with him from March to November 2002 with daily phone calls and daily emailS, possibly up to 25 - 30 a day - a ride on the roller-coaster. In August 2002 I flew to Tokyo to pay him a visit. That was still the time when nobody knew where in the world he was living. I want to bring my testimony that he was a good-hearted individual, highly sensitive, affectionate and genuine. In one of my early emails to him (he did receive them on his cell phone) I asked him whether he was still a dreamer and he replied "more than ever". He enjoyed spending time at thermal baths or springs so when I arrived in Tokyo I had to wait a few days for him to get back in town. I met him on a Sunday morning in the district of Shibuya. he made me smile when he said that I must have been "very clever!" since I had been there only for a few days and already knew how to read the subway map. He told me that he he had been in Tokyo for 6 years but he still couldn't figure out how the subway worked - he only knew how to go from his home to either Shibuya or Shinjuku. Very sweet. He was extremely fond of animals. We went to the Ueno park in Tokyo. there we had a walk and we sat down at a café and he ordered tea and a pizza. Whenever a cat would approach he would try to feed him a small bite of pizza and if the cat walked away Bobby would stand up and run after the cat. Jan-22-08 Liz: PART 2: My most special memory of him remains this: we were sitting on a bench in the Ueno park and Bobby was discussing films he had seen and enjoyed. At some point a black crow approached (for those who don't know - in Ueno there are HUGE black crows, so huge I had never seen) and Bobby suddenly stopped speaking. He looked at the crow and said "LOOK! WHAT A BEAUTY". And I felt as if time had stopped, and we were surrounded by a sense of suspended beauty. Now whenever I remember this I start to cry. Such was Bobby Fischer: one whose immense sensitivity allowed him to see beauty in the smallest and simplest thing. He was also melancholy: whan I asked him if he believed (I don't) if happiness was possible he replied that he never thought of it because it was "too painful". 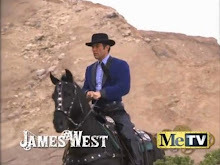 He enjoyed spending time with people. He was very friendly, and affectionate. He used to call me "Liz" a shortened version, according to him, of my name, Elisa. I remember the first time he phoned me - at 3.20 am. He didn't believe i was a girl of 26, he thought I was a journalist trying to cheat him. When I answered his call he said "Elisa?" and I said "Yes?". Then he was silent for a moment, then gave a short laugh and replied "Hi, this is Bobby". I always had the feeling that all he was asking of people was kindness and understanding. If you granted him this he could be very relaxed around you. I feel sorry because many people have a distorted image of him. This is not to say he wasn't a difficult character - he was indeed and one had to be careful with what one was saying to him. But I am confident that anyone who has had the privilege of spending a little time with him and talk to him will agree with me that an immense and fragile beauty dwelled in him. He had a pure heart, like a child's. And somehow he had managed to retain that innocence into adulthood - an innocence that most people lose when they come of age. By the end of the year our correspondence was less frequent. He was only writing occasionally. I asked him many times the reason behind this but never managed to get a satisfactory answer. I guess one has to accept this as part of Bobby's personality: that someday he might disappear and you are left hurt and wondering why. Since he left Japan I never heard from him again. A couple of months ago I decided that I would try and contact him again: maybe this time he would reply. I didn't know he was ill - if I had known I would have flown to Iceland. Now it is too late and my deepest grief is that I was not able to say goodbye. However I am happy that I wrote him a long hand-written letter before leaving Japan to come back to Italy: in the letter I made clear what my thoughts of him were: that he was a bautiful individual, kind, sensitive and very very special. That there was a beauty in him that surpassed all human imagination. And that he remained the best thing I had seen in my whole life. Today I still feel that way. Goodbye, Bobby, from those of us who love you. Jan-22-08 Liz: Since some has inquired I would like to point out that I am not a chess player. I am an individual who, under of a set of really incredible circumstances, had the privilege of briefly be acquainted with Bobby Fischer. Bobby also inquired if I was a chess player and when I told him that no, I wasn't, and that I had no idea how the different chess pieces move I feared he would be disappointed, that he was solely interested in chess, but I was wrong. He gave a laugh and said "oh that's better" - he sounded pleased. I think it's because he enjoyed people who appreciated him as a person much better than those who approached him as the "World Chess Champion". There was this craving for understanding in him. I keep one of his emails in my wallet which says: "Thank you, Liz! You are so kind and understanding to me. Are you for real?". He never discussed chess on the day that we spent together except for once when we went to this book-store in Shinjuku where he saw a book on whose cover was a chess piece. He said "Chess!" and that was all he ever said about chess in the months when we corresponded. "Liz" is the way he used to call me as he thought it would make a nice shortened version for my real name, Elisa. I recall he would call me "Elisa" whenever he was speaking more seriously and "Liz" when we had a more relaxed conversation. I did include my real name in the post as I think there is no reason for fearing revealing one's identity when dealing with important matters such as the passing away of an individual. I know there are people in this forum who admired Bobby and I thought it would be nice to share with you my experience which only I and close friends of mine are aware of and which reveals a more private side of his personality. I wish I could have talked to my parents about the reason why I was in such distress last week-end but I couldn't (my parents still don't know the true reason why I made that trip from Italy to Japan). When somebody you have known passes away, it is strange this need that you have to remember them and talk about them to people. You feel that if you don't you're going to choke. I guess it is the way of dealing with loss. I wish to thank those of you who have replied: this helps easing the grief I am experiencing in these days. I think that those of us who were lucky to spend time with him him felt a bit lonelier on the day he died. I feel as if I were aware that, with his death, Innocence has lost another square to Corruption in the world. I like to think that he is in Heaven now with his mother, his sister and her Persian cat, of which he was very fond. A friend and I went out the other night to look at the sky and we spotted 3 stars, close to one another and perfectly in line. 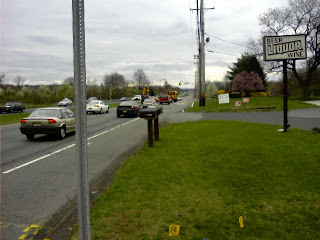 We decided that they were Bobby, Regina and Joan and we waved our hands. I like to think that they were together watching, and smiling at us. Thanks everybody in this forum, really. Thank you. At today's Spring Viking Deluxe GP tournament, I snapped these photos. In the first picture, you see TD Ken Thomas and assistant TD Aaron Kiedes. This is what the Dean of Chess Academy looks like before the players arrive. 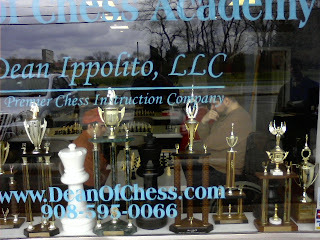 There is chess equipment for sale at the Dean of Chess Academy. 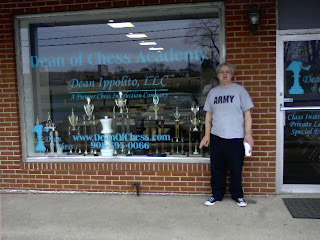 The Dean of Chess Academy is located on Highway 202 North in Branchburg NJ. It is situated in a shopping mall. Blogger Atomic Patzer was an early arrival. This photograph was taken before the start of round one. Here is round one, as seen from the outside looking in. 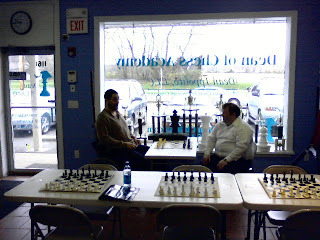 In round two, Dean Ippolito played the black pieces against Boris Privman on the top board. Their game ended in a draw. On board two, Justin Sarkar defeated Atlantic Chess News editor Steve Ferrero. The asterisk indicates that the book is a hoax! 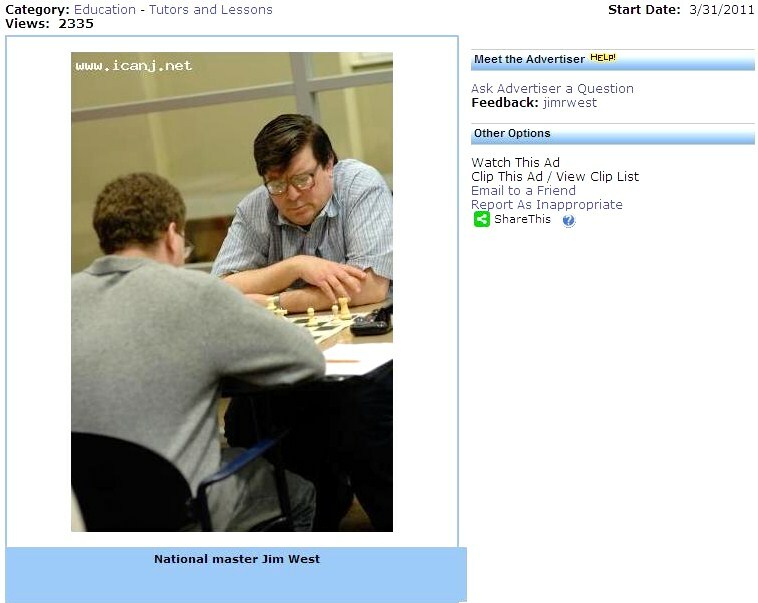 At least, that is the opinion of GM Larry Evans in his article at Chess Life Online. In analyzing my Marshall swindle against Jason Margiotta, I have found a theoretical novelty in the Fajarowicz variation of the Budapest. After the opening moves 1.d4 Nf6 2.c4 e5 3.dxe5 Ne4 4.a3 Nc6 5.Nf3, Tim Harding in his book The Fighting Fajarowicz gives 5...a5?! as dubious following 6.Qc2! d5 7.exd6 Nxd6 8.Nc3! which is "marvelous for White," according to Joel Benjamin and Eric Schiller in their book Unorthodox Openings. Harding adds, "I think they are right. Obviously 8...Nxc4? loses to 9.Qe4+...."
But it does not lose! What everyone has overlooked is that 9...Be6 10.Ng5 Nd6 11.Nxe6 (better 11.Qc2=) works out to Black's advantage after 11...Nxe4 12.Nxd8 Rxd8! 13.Nxe4 Nd4!! when Black will win the exchange by 14.Kd2 Nb3+ 15.Kc3 Nxa1 16.Bf4 Rd1. On his way to a tie for eighth place in the under 1500 section at Foxwoods, Ziping Liu defeated Mario Russo in the following game. In this position, White usually plays 9.Be3. Instead the game Ristic-Barlov, Osijek 1982 continued with 12...Nfd7 followed by 13...Nc5. Now White would have a clear advantage by 17.Bd3. This inaccurate move should have been punished by 20.b4 Qxb4 21.Bxc6. Correct for Black is 19...Rbb8. 28.Qxb6 Rxb6 29.a5 Rxb4 30.a6 Ra8, White forfeits. 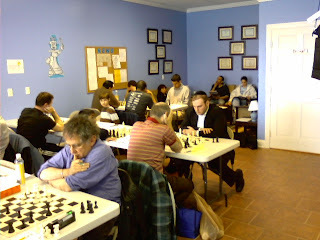 According to blogger Chessbuff on Chess, New Jersey resident GM Boris Gulko has accepted an invitation to give a 30-board simul next Monday, April 14th, at Dumont Chess Mates. 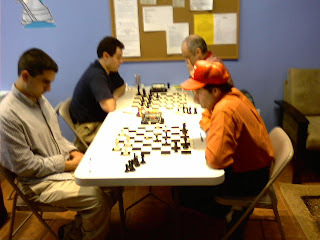 The cost to play in the simul is $20, plus a $5 admission fee. For more information, contact club president Lawrence Constance at lacon1963@yahoo.com. Marshall Chess Club president Frank Brady will serve as a consultant for HBO on a docudrama about the chess match of the century, between Bobby Fischer and Boris Spassky in 1972. 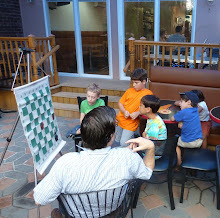 At yesterday's Polgar Chess Center quad, I found time to snap these photos. The first picture was taken before round one. 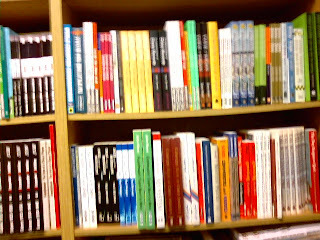 This is a photo of the many books for sale. 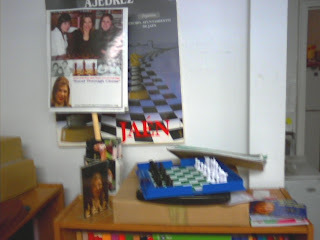 Here you see a wall poster as well as a magnetic chess set. 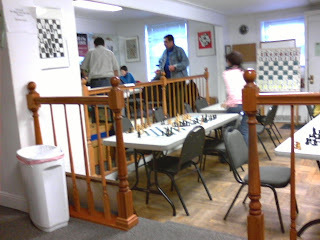 Earlier today, I finished with a score of 2-1-0 in a game/45 quad at the Polgar Chess Center. Here is my best game. I am calling it a Philidor Counter Gambit because the opening transposes into a line often reached by the move order 1.e4 e5 2.Nf3 d6 3.Nc3 f5 4.d3, etc. 38.Kf3 Rb3+ 39.Ke2 d3+ 40.Kd2 Kg7 41.Rc7+ Kh6 42.Rc3 Rxb6 43.Rxd3 Re6 44.Rh3+ Kg7, White resigns. My post at Jim West Talks Chess on the Sicilian Najdorf 6.Bg5 line has received some favorable comments. 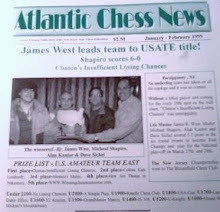 The following tournament life announcement does not appear in Chess Life or at the USCF website, but it can be found at the NJSCF website. 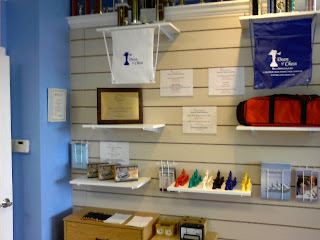 Ridgewood United Methodist Church, 100 Dayton Street, Ridgewood, NJ 3RR G/75 EF: $25 Prizes: $50 first each quad. Rds: 10, 1:30, 4 Reg. 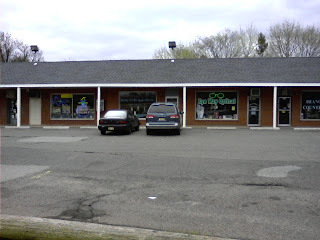 : 9-9:45 Info: Lawrence Constance 201-568-1506/lacon1963@yahoo.com. NS, NC, W. Free refreshments served during registration. 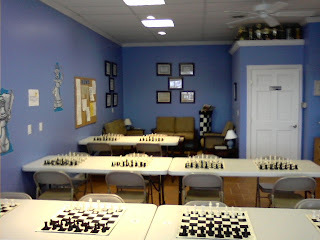 Dumont Chess Mates president Lawrence Constance tells me that the refreshments will include coffee, bagels, and doughnuts. A half-century ago, a teenager named Bobby Fischer was the talk of the town in The New Yorker magazine. On the bulletin board at the Marshall Chess Club, there are many newspaper clippings about Bobby Fischer, including this interview with club president Frank Brady. "My 59 Memorable Philidor Counter Gambits"
At a recent seance, I posed this question to the ghost of Philidor, "Is it really true that you never played your own defense?" 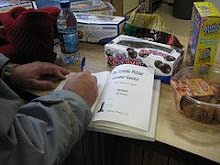 The astonishing reply: not only had Philidor played the PCG but before his death he penned a book, as yet unknown in modern chess literature, bearing the title My 59 Memorable Philidor Counter Gambits. The one remaining copy was being kept in a safe place by a man in Paris known only as Henri. As the seance drew to a close, Philidor's ghost uttered these ominous words, "You were much more than Jonathan, mon ami," leaving me to ponder the meaning of this cryptic message. 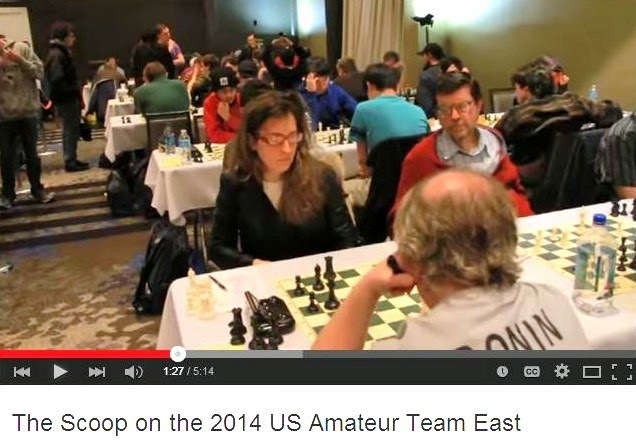 Could "Jonathan" be GM Jonathan Mestel who played the PCG a few times in the 1970's? Was Philidor trying to tell me that I am now the leading practitioner of his opening? While these questions swirled in my mind, I followed Philidor's instructions by sending an e-mail to Henri, telling him to ship the book in a crate to the seller, a Haitian woman in Quebec City. This rare edition will become the prized possession of the first person to bid 1 million euros. Philidor's ghost will not accept checks drawn on French banks.